Joining in with Michelle and her new meme celebrating what’s in flower in the garden right now. 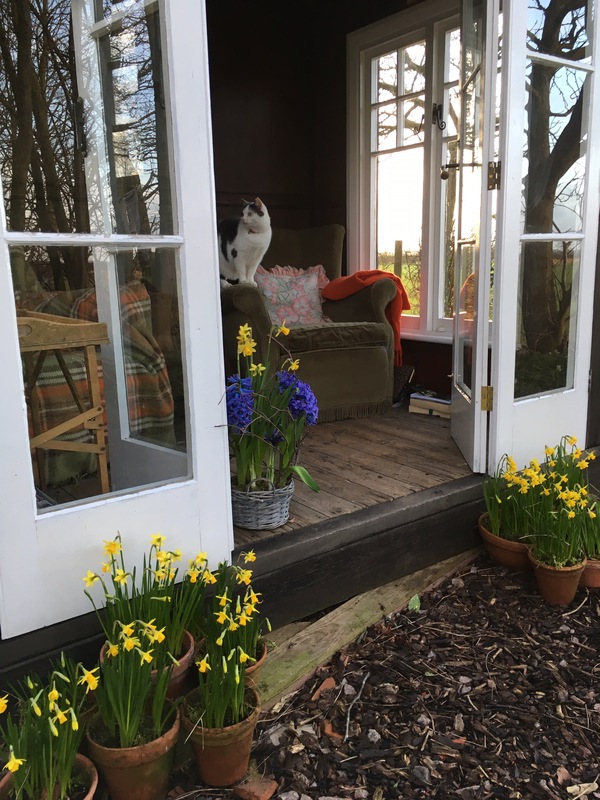 It’s been sunny and warm enough on a couple of days to open the summerhouse doors. Grace cat has appreciated the warm weather. I’ve propped up the blue hyacinths with hazel twigs. Catkins are a perfect match for spring bulbs. Tete a tete daffodils were planted in pots in October and put behind the pottingshed out of sight. Luckily I looked the other day, and they were in full flower. A week or two earlier than last year. This is the current view looking out from the summerhouse. The mini-wood will soon be bursting into leaf. Snowdrops bought at Hodsock Priory are starting to spread. There’s a patch of wild garlic I shall be harvesting soon to make a delicious soup. 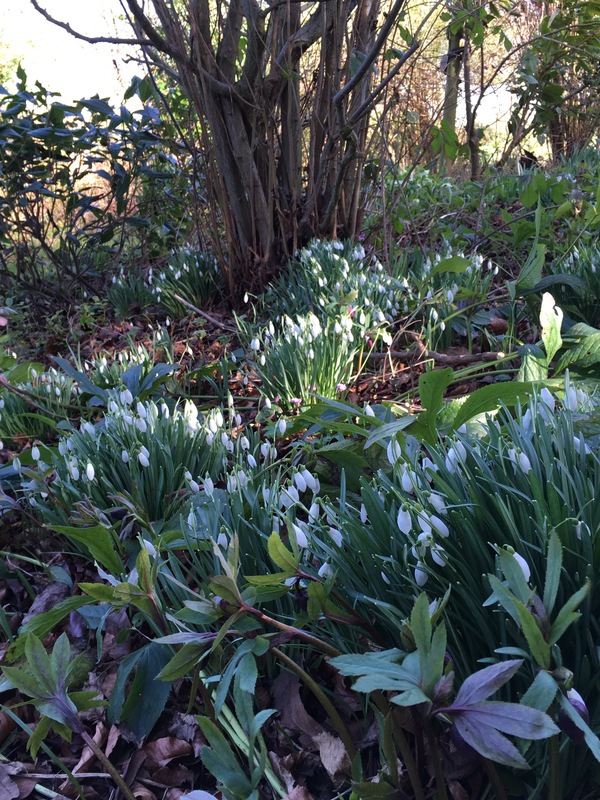 It only takes a few years for the patches of snowdrops to bulk up. I will be dividing these in the next week or so. 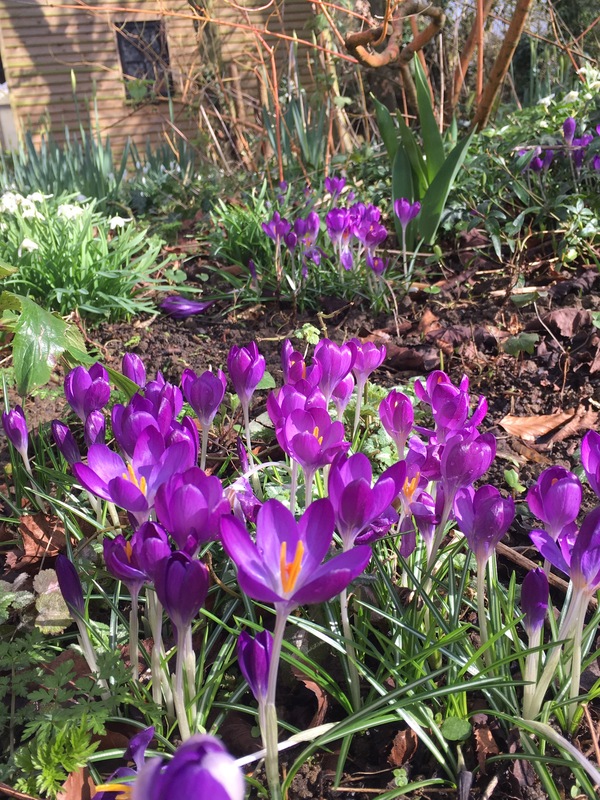 I will dig up a clump, break them into half, put half back in the planting hole and spread the others about, incorporating some grit and leafmould in the planting pockets. I’m saying goodbye to the aconite flowers for another year. Finally, after years of trying, they have taken off and are spreading across the wild garden. Incorporating lots of leafmould each year seems to be the answer. Plus patience. They really do only grow where they want to. I very nearly gave up to be honest. At the side of the pottingshed there’s another wild garden where snowdrops and tiny crocus are making themselves at home. I love looking out of the side windows at this view. Wild daffodils are finally starting to spread too. This was just one flowerhead last year. I am really happy to see it settling in with three flowers this year. 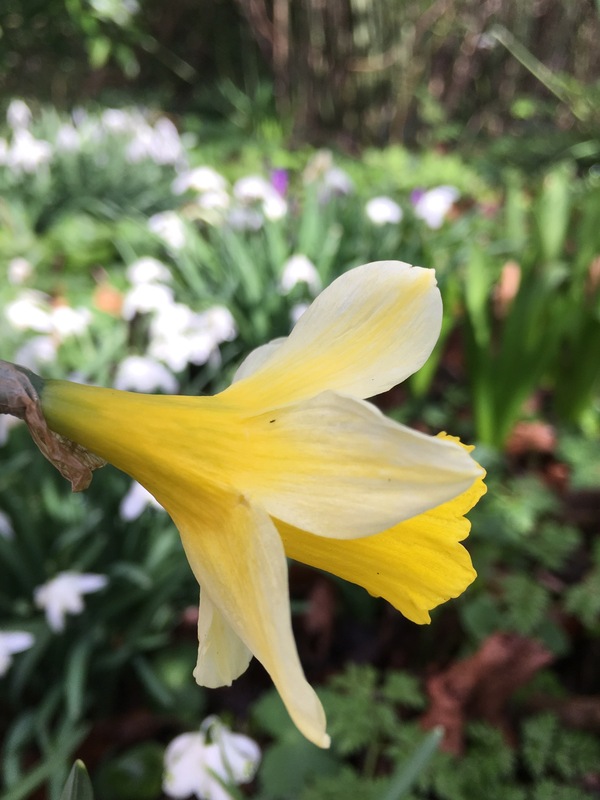 I think it’s my favourite daffodil. Such a delicate flower. 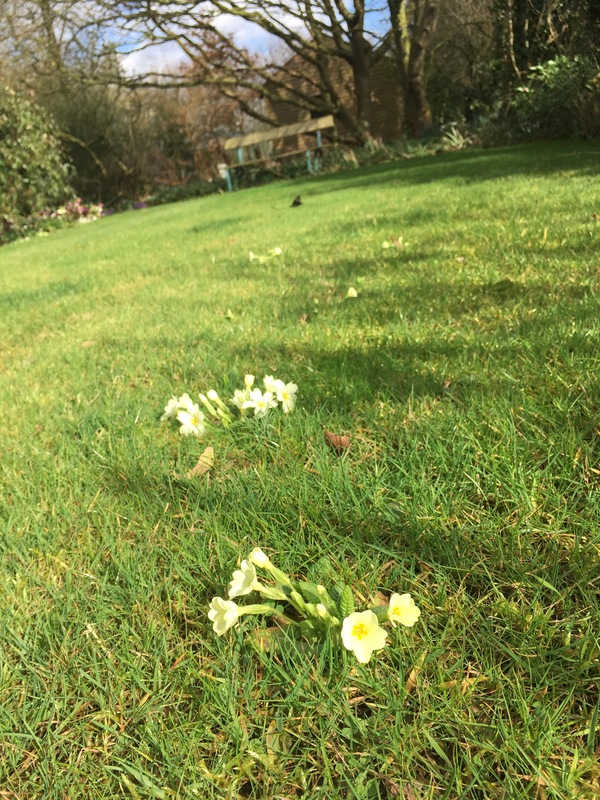 Primroses are escaping from the borders and making themselves at home in the lawn. A lovely consequence of giving up on the lawn feed and weed regime. Soon the whole front lawn will be awash with blue scented wild violets. They virtually pop up overnight. Such a wonderful sight to come home to. 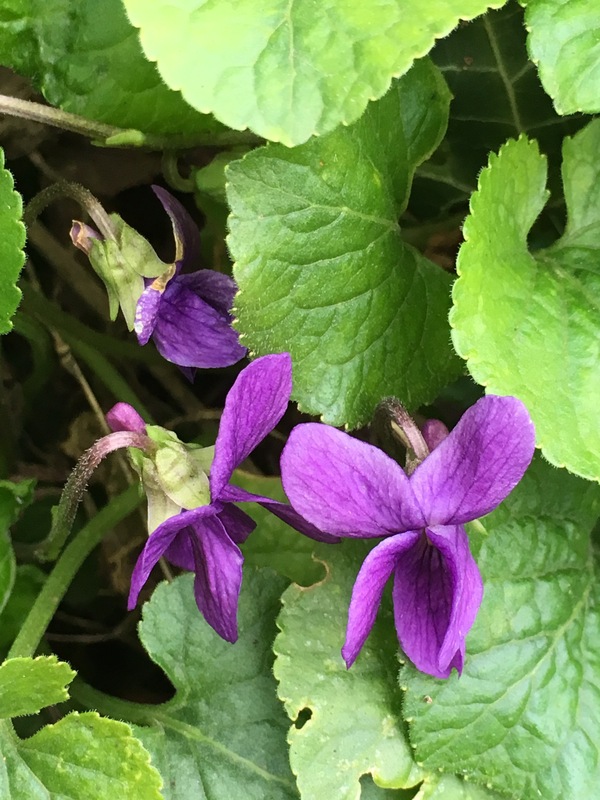 There are violets by the front gate and all along the sunny front hedge bottom. 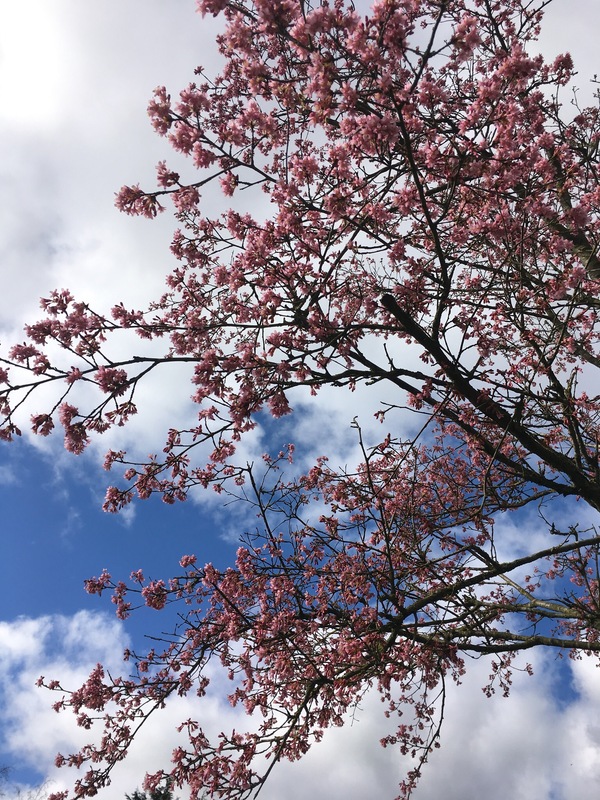 Eagerly awaited every spring- Prunus Okame is the first tree to flower in my garden. A blue sky is the perfect background for such a pretty pale pink flower. 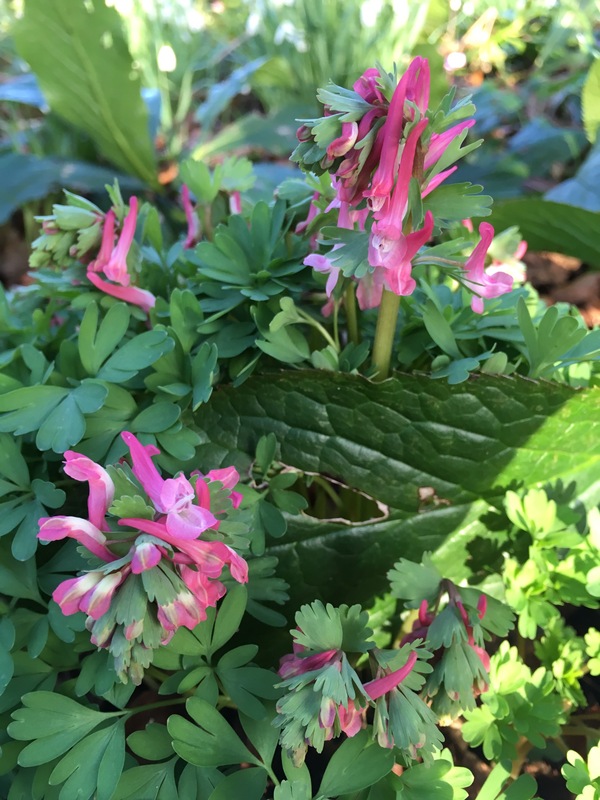 A pink corydalis is thriving under the prunus and lives quite happily underneath the hellebores in shade. 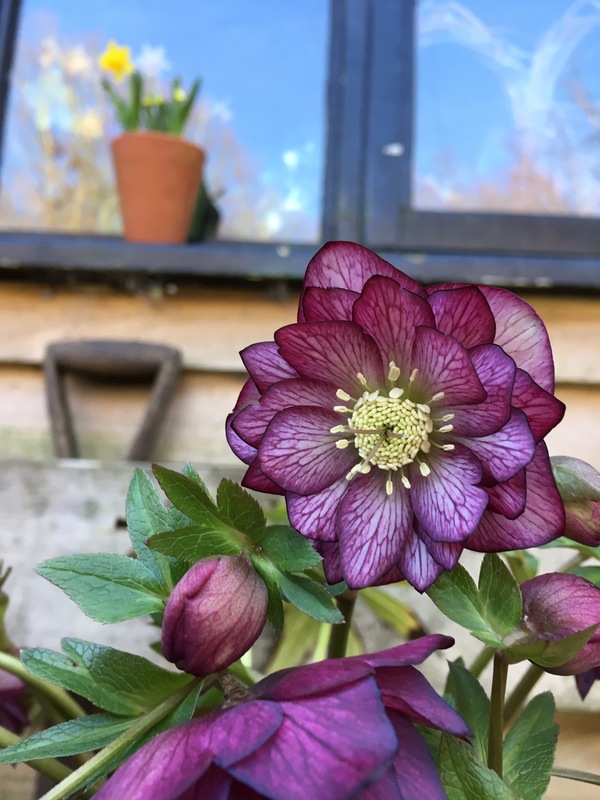 My favourite hellebore right now. It reminds me of a stained glass window. 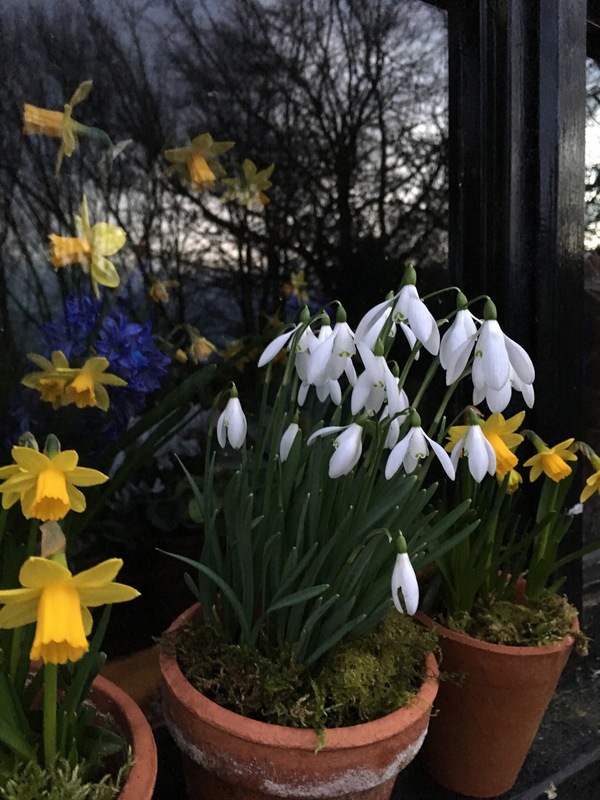 And finally, the pottingshed windowsill has pots of tiny tete a tete daffodils and single snowdrops. 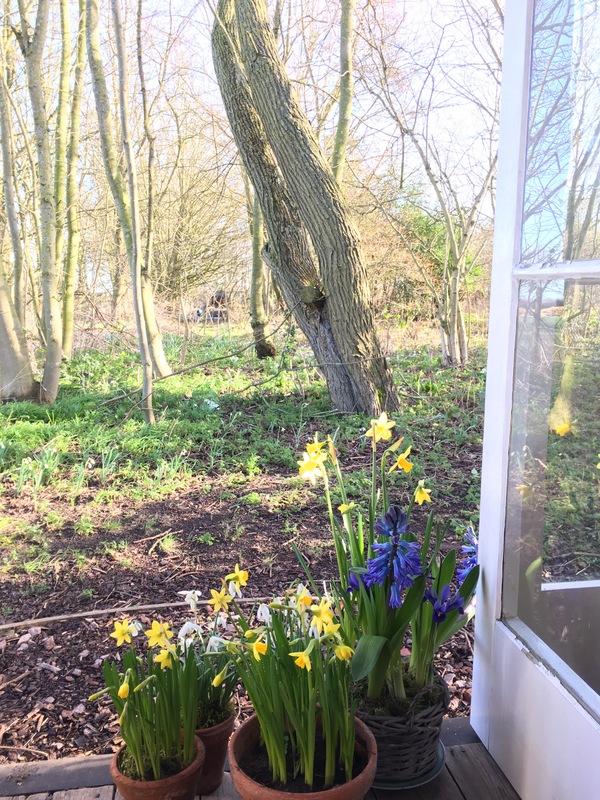 You can just see the blue hyacinths and matching daffodils inside the shed where the scent is intoxicating- mixed with smells of petrol for the mower and compost on the potting bench! I hope you have enjoyed my whistle-stop tour of the garden today. Thank you to Michelle for hosting this new meme. Why don’t you go over and see what’s looking good today in Michelle’s garden on www.http://vegplotting.blogspot.co.uk . Join in- all welcome! ← Front door willow wreath with Jacob hellebores, dried white hydrangea, seeds and euonymus. Feel free to have a look at my Pinterest pages. Loved it Karen, and thank to you for naming each flower. Beautiful photos. Makes one feel cheerful seeing Spring beginning to blossom. 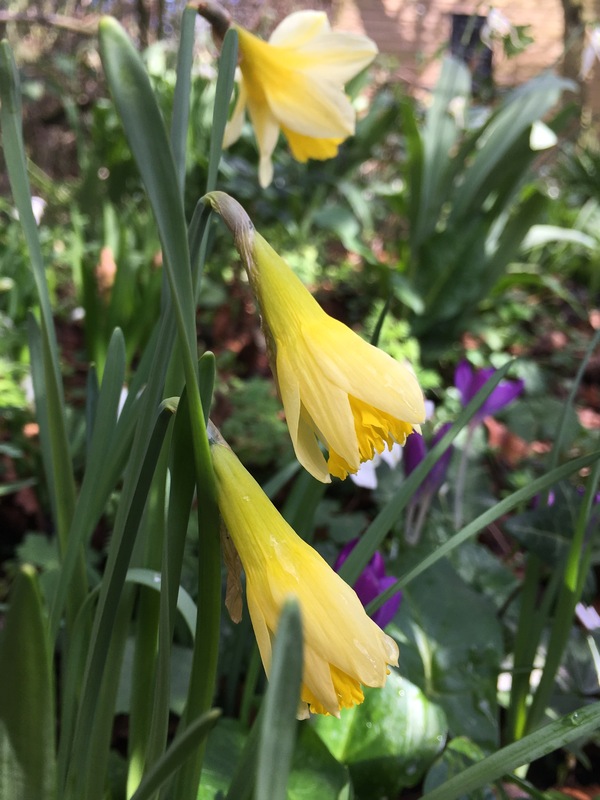 Love all your bulbs and blossom, spring has certainly arrived in your garden. Thank you Pauline. It’s been a long winter. So glad to see some flowers and the bees returning to the garden. Thanks for reading and commenting. Have a good week. I love your first photo, especially the pose of Grace cat 🙂 I’m envious your aconites have finally started to spread themselves about. I planted a row of them at the top of the bank in the front side garden and they’ve remained stubbornly there and not spread themselves down the bank as I’d intended! Thank you Michelle, and thanks for hosting the new meme. I was rather late to the party as I was doing the gardening radio show and got home late. Those aconites have been such a struggle. None of them are in the areas I originally planted. They seem to have moved themselves (or the mice have moved them) to the places where they are more comfortable. I didn’t get any of the guesses right.in the end, I just kept mulching the area under the trees with leafmould. I add one small pot of aconites every year. This year, the ones I planted near the front gate post have come up right in the middle of the drive. Quite tricky to persuade the husband and two girls not to drive over them! There are a few bluebells along the ditch and in the wild garden. Unfortunately, there are some Spanish bluebells too, so each year I have to weed those out. Not an easy task, but worth it to preserve the native beauty. A wonderland of blooms! Simply beautiful. THank you Cathy. Hope your weather improves soon. Sunny here today, but whole garden is like a bog from so much rain. Lots of lovelies to keep you smiling Karen. We had a whirlwind last night. I can’t even begin to describe what it was like. 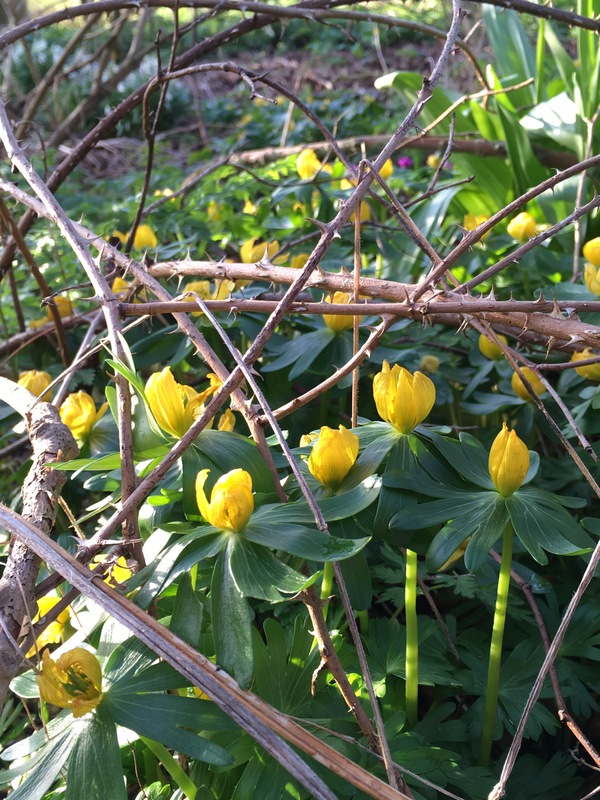 Interesting to read about your experience with aconites, I’ve been totally unsuccessful here. I thought the mice had got them but perhaps I should try again and just persevere.